We here at The Final Turn stood True and Firm to Honour the above Soldier. 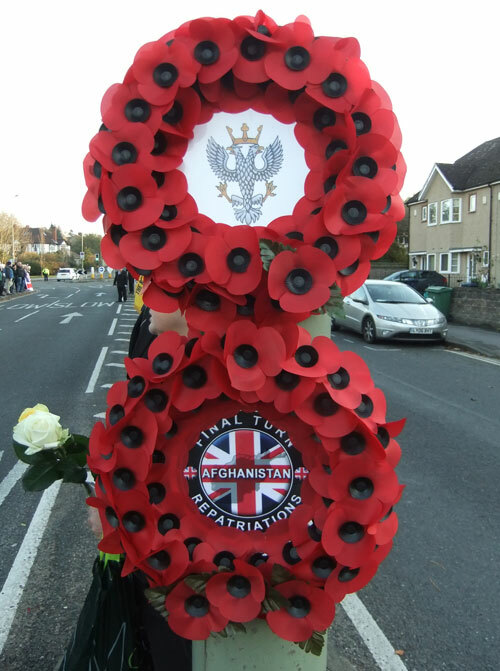 There were 9 B/Legion Standards: Bicester, Bicester & Launton, Bodicote, Chalgrove, Headington, Kidlington, Kidlington (Women’s), Marston, and Wheatley. 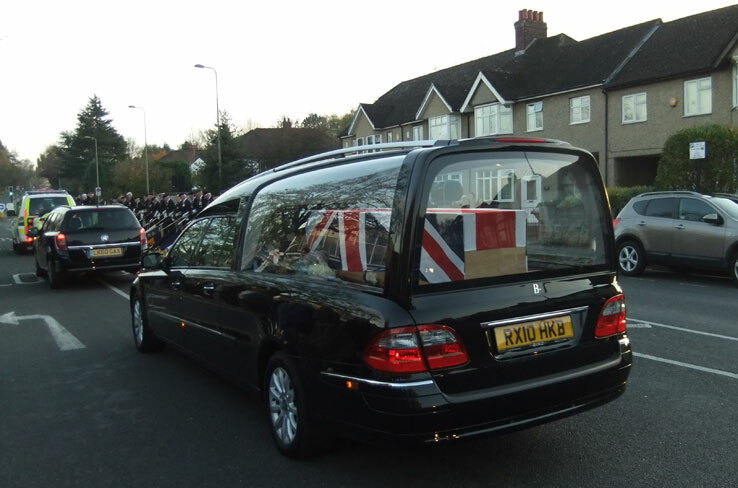 Association Standards: Coldstream Guards, Canal Zoners (Oxon), Guards Division (Newbury), Parachute Regiment (Oxon), RAF Police, Royal Marine/Navy (Oxon), Royal Fleet Auxiliary (London & District), Royal Tank Regiment (Oxon). St George Society, St John’s. The Banner of the Royal Dragoon Guards. 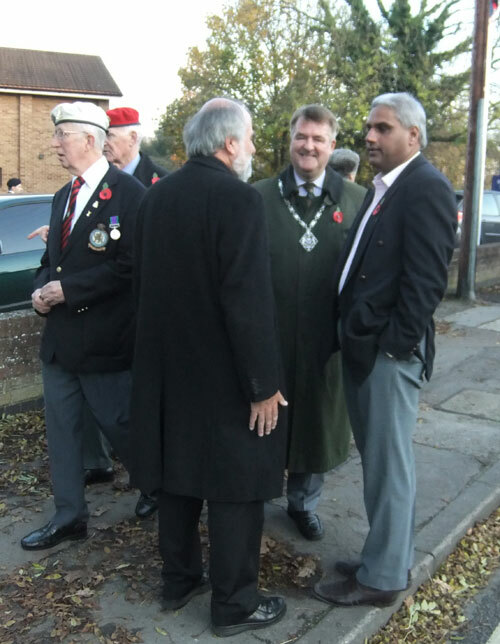 Deputy Lord Mayor of Oxford Cllr Alan Armitage.Cllr Altaf Khan. The very Rev Robert Wilkes, Col (Retd) B. Duncan, MBE, Royal Tank Regt, and Lt/Col D. Mead, TD. 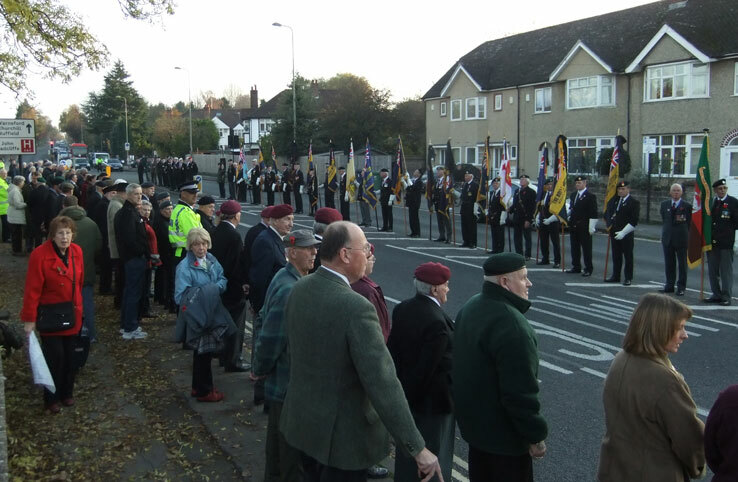 There were 45 Veterans in Berets and 35 others from all three services. 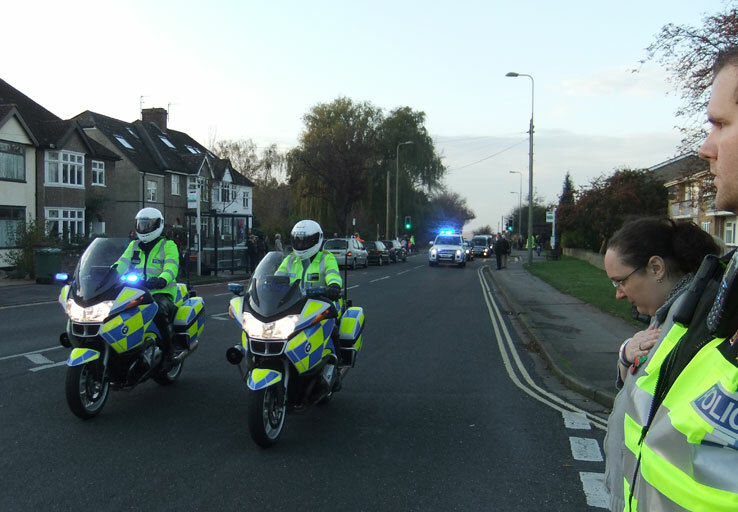 Thames Valley Police during their normal duties and some on Parade along side of us all under the command of Inspector N. Qureshi. Graham Choldcroft (Chaplain), Thames Valley Police. Oxford City Fire & Rescue Services with their Tender and as always with their huge Union Flag. Mary and John from the Church (John having half-masted the Union Flag early in the morning). There were 250 people from the Oxford public here at the Final Turn and many all along the Oxford ring road leading into the Marston area up the Headley hill to us at the Church (The Final Turn). Huge Union Flags on route and always nice to see The Flag of Ulster. 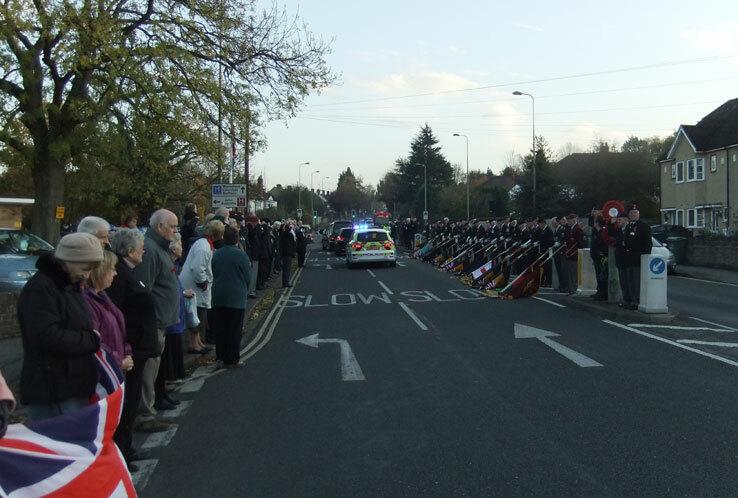 I point out here that for the first time we had The Standard of St John’s on Parade with us (although they are always normally here with their ambulance). The Standard party was Div/President Moya Lee, Superintendent John Jones, and Sgt Ann Collier. Their drill and dress were 1st Class. The weather was overcast and 15°c. The Cortège passed us by at 1535 hrs. The Parade Marshall was G. Whelan (former Para), 2i/c J. Lewendon (former R.A.). We all had sad thoughts as we left know we will be back on Parade next week to see Home another Soldier.